Jupiter can give success from 12th September 2017 and 11th October 2018. 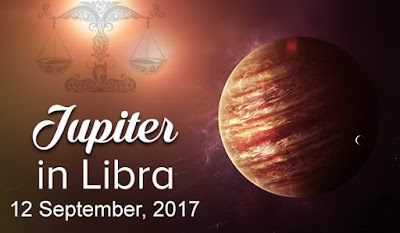 Good Jupiter: When you get feeling of love in idol, elder and other relations. Live become good, acidity in stomach goes away, one get less pain in calf and waist. When one likes study, creative, spiritual, religion and service work. One get good health and one like to know and like to go on religious place. One likes to serve birds, animals, plants and people. One likes to eat good food and wake up before sunrise. All these are the signs of good Jupiter. It will give you success. Weak Jupiter: One face health issues, stomach and liver problems. One dislike elder, idol and beast-animals. One likes to live alone and they started cutting from others. One gets pride and hurt people. One gets negativity and remains restless. One gets pain in calf and waist. One faces financial problem and spends money in diseases. Weak Jupiter creates many problems. To avoid these problems, feed jaggery to cow on every Tuesday and Thursday. Do not feed plastic to cow. Every Thursday, donate any five fruits to poor person. Donate medicines to any poor old on shukal paksh’s Thursday. Give respect to old age, idol and teachers. Daily, apply tilak of white sandalwood, saffron, and turmeric with milk or yogurt. Daily, do this tilak on navel, heart, throat, tongue and forehead. If one cannot like to study and people goes away then take raw turmeric knot and tie it in yellow color cloth. Wear it in throat. You can also wear the root of orange in orange color thread. Taurus: It gives good results. They will get benefit of property, prestige and knowledge. Take care of your stomach, waist and parents. Gemini: Time is weak. There would be problem in knowledge. One will also face wealth problems. Cancer: It will give good results. Property and health problems will solve. One might get solution for blood and heart issues. Leo: They might face problems. However, they might get success in competitive exam. People can move in the direction marriage. Virgo: There might be new relations. There would be auspicious work. However, there might be health issues. Take care of eyes, teeth and throat. Take special care of teeth. Time is good for wealth and prestige. Do not get angry. Libra: Take care of breath and liver. Take special care of your parents. There would be development. Scorpio: The enemies will become powerful. Avoid doing bad work. Keep the paper carefully. Think before giving testimony and signature. Sagittarius: The change of Jupiter is good. One might get wealth. There might be change in employment or business. Capricorn: They will get good results. Problems will reduce. One should do hard work. Aquarius: Take care of your health. There would be improvement in employment, education or business. Pisces: Those with religious activities will get benefit. They might become ill.
Do not pride. Do not greed. Leave the criticism. Read and donate religious books. Wear three faces Rudraksha garland on Thursday. Eat pomegranate and drink turmeric milk. Donate turmeric and rice on every Thursday. On Thursday, donate honey for 2-3 times in a month. Give respect to elders and sisters-women. Take special care of throat.